During the 1962 Friendship 7 mission, John Glenn experiences weightlessness. 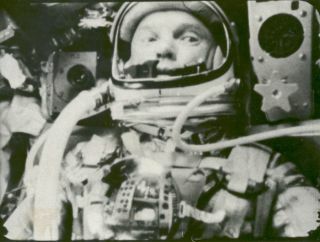 In this historical photo from the U.S. space agency, Astronaut John Glenn photographed in space by an automatic sequence motion picture camera during his flight on "Friendship 7." Glenn was in a state of weightlessness traveling at 17,500 mph as these pictures were taken.